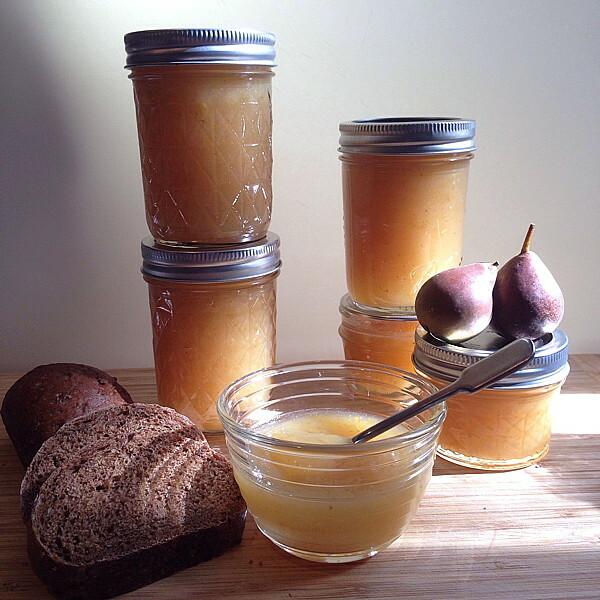 Small-batch Ginger Pear Butter - Get the Good Stuff! This smooth pear preserve with a tang of ginger is excellent with toast or scones, would be perfect with gingerbread, and delightful with shards of chocolate in an autumn crostata. The only word that properly describes it is a 'butter' – it has the mouthfeel of apple butter with the taste of gingery pears. I like to cook the pears quickly to highlight their fresh taste. I use sugar to draw juice from the pears, add lemon juice and a bit of chopped candied ginger, cook the resulting mixture, and then purée it with an immersion blender. Like all small batches, this goes together quickly. A note: pears with slight bruising are okay to use, but cut out any dark brown bits. Rinse the pears well, but don’t bother peeling them. Cut into quarters; remove and discard the cores. Cut into small pieces – I had a bit more than 2½ pounds of chopped pears – and put them in a heavy-bottomed pot. (I used my favorite 4 qt pot, which was perfect for the task.) Add the sugar and lemon juice, then stir well, cover with a clean tea towel, and let stand 1 to 2 hours to bring the juice out of the fruit. Put 4 8-oz jars in a pot, cover them with water, and bring the pot to a boil. Boil the jars for 10 minutes, then turn off the heat, cover the pot, and let the jars stand. Wash the lids in warm water and set aside (see new procedures for jar lids!) Keep the bands handy. Put a saucer or small plate in your refrigerator to chill (this will be for testing doneness.) Have an extra small jar, or custard cup, clean and ready for any excess. When you’re ready for the cooking – you’ll need 45 – 60 minutes, no more – add the candied ginger and a tiny pat of butter, then bring the mixture to a boil. Reduce the heat to low and simmer the mixture, uncovered, until the fruit is translucent and cooked through. The smaller the pieces are, the faster this goes. When the fruit is all soft and tender, remove the pot from the heat and whiz the mixture with an immersion blender to make a smooth puree. Return the pot to the heat, and bring it back to a boil, then simmer on low heat. Stir often: it is easy to burn if the burner is set too high. Cook until thick and gloppy. I like to test for doneness by putting a spoonful on a saucer, and chilling it in the refrigerator for 2 minutes. After that time, if I can drag my finger through the fruit butter, and leave a clear track that doesn’t fill in again, it’s ready. Ladle the mixture into prepared jars, wipe rims, and apply lids and bands. Anything that won’t fit in your four jars can go into the clean custard cup. Chill it in the fridge: this is perfect with yogurt or on toast for breakfast! Process the jars as usual in a boiling water bath for 10 minutes.